Dave has been responsible for the production of over 12,000 custom steel frames. Dave ran his first framebuilding course in 1998. Over 200 people have attended his courses from around the world. 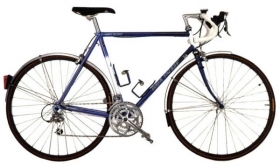 Dave has repaired thousands of steel frames, bent, broken, old or neglected, giving many more years of life. Lifelong cyclist and former metalwork teacher Dave Yates is one of cycling's true legends. 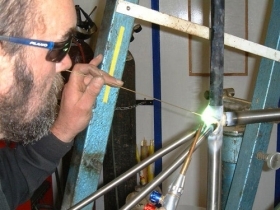 Initially in his garage in the North East, then 25 years with M Steel Cycles, and more recently his smallholding in Lincolnshire, Dave has earned a worldwide reputation for designing and building steel bike frames of the very highest quality. From a 6" mountain bike frame to a 31" road frame, Dave has personally been there and built it! All Dave's frames are underpinned by his vast cycling experience. From his first 'sit up and beg' roadster aged 14, gaining his 1st Category racing licence in 10 races and a spell racing in Brittany, to riding Paris-Brest-Paris, London-Edinburgh-London and Lands End-Johno Groats. 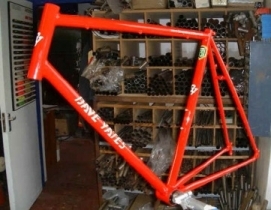 In Dave's own words "Building top quality frames is an intuitive business. You need the technical skills and the right materials....... but you also needs loads of experience and that extra indefinable feel for framebuilding to create something really special."